Beautiful pages, so much detail! You sketchbook will be fantastic when it's finished. I thought I'd got quite a long way on my mine, but then I counted the pages left...I'll have to do at least 15 more pages if not more. I'm fishing about for some more ideas at the moment! Well if they are all as inviting looking as that bowlful that would not be a bad thing! This is exquisite! I can see every single noodle individually! And I love the steamy look all around! Well done! Cathy, I know what you mean, I was really happy when I reached half-way then suddenly overwhelmed....torn between wanting to do so much more/ wanting to finish and move to pastures new....have you seen the rip out perforations start not so long after the middle? 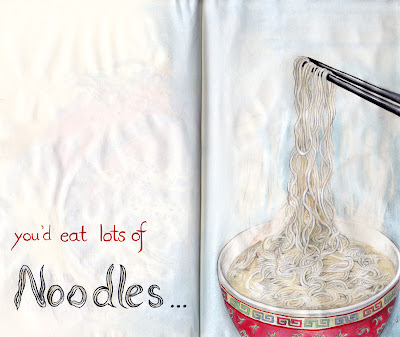 I love, love, love those noodles! The detail is so interesting and quirky, and it's so very noodle-like. Such fun to look at - was it fun to draw? These are fabulous Debra. The detail in both noodles and bowl is fabulous! Wow! This is awesome! So beautifully done! I also love the simplicity of your journal spread! I've just browsed through this blog page, and I enjoyed it a lot, your work is fantastic! This page is awesome - beautiful and so detailed - I'm awed by your skill and also by your patience ^^ ! I've never seen noodles done so perfectly! 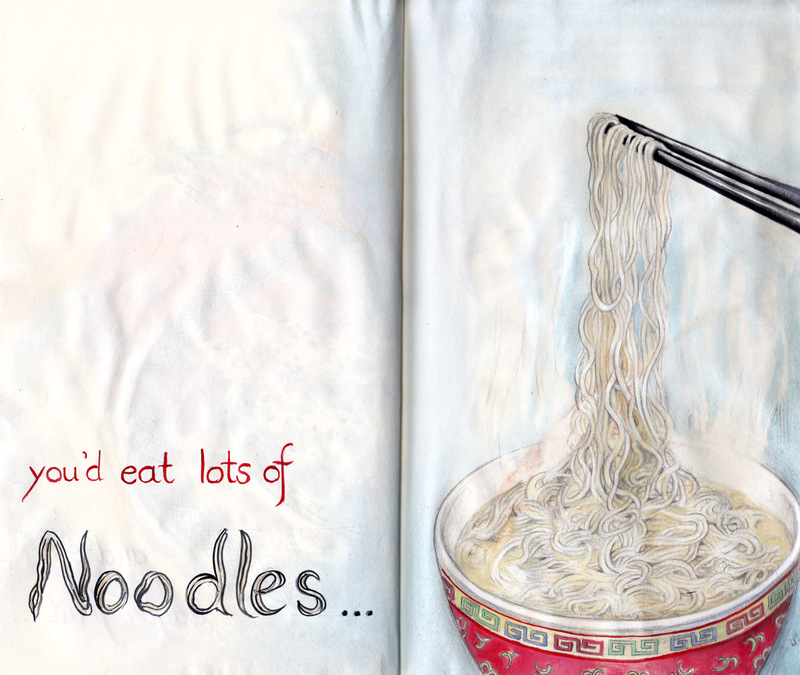 Love all the detail in those noodles! I really like all your work. It's beautiful. Also, the words you use make me feel like someone is gently inviting me into the picture. Thank you for being an artist. Nicely done. I can smell the aroma of those spicy noodles. :) Love the page. Your details really wrap up the package.